Join in the celebrations as one of our historical buildings, Cockenzie Business Centre in East Lothian, celebrates its 150th anniversary this year. At Bizspace we have 30 business centres in buildings of historical interest. One of these is Cockenzie Business Centre, East Lothian, which is celebrating its 150th anniversary this year. The building was formerly Cockenzie School, which closed around the 1960s and the centre has been carefully looked after to retain much of its original charm and character. Our on-site team is organising a ‘birthday party’ for the building and we are inviting everyone to join in the fun. What we’d love in particular is for any former pupils of the school to come along, or anyone who has worked at the building over the years. The event, on Friday 5 June, coincides with the Three Harbours Arts Festival, which will see artworks installed in unusual locations throughout the area. The centre even has its own artist in residence, Andrew Crummy, who designed the Great Tapestry of Scotland. 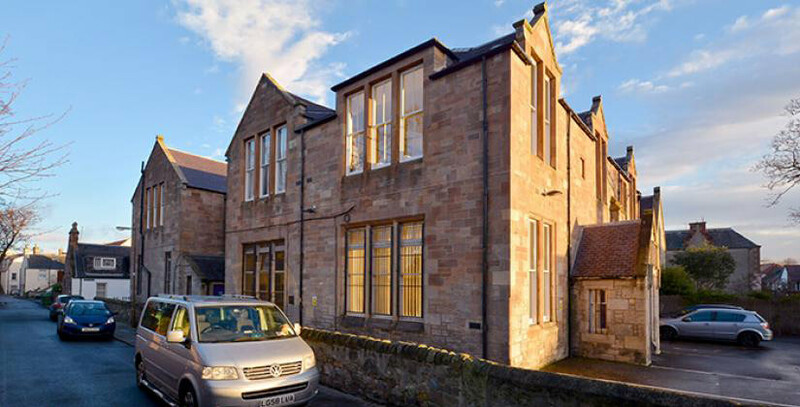 Cockenzie Business Centre Manager, Gavin Luna, says: “We are very lucky to have a business centre within a beautiful building that has such a rich history. “When we realised that 2015 was the building’s 150th anniversary, we couldn’t let it go by without some kind of celebration, and to tie-in with the festival seemed like the perfect idea. Eleven companies have their home in the business centre’s offices, including Greentrax Recordings, which has been based there more than 10 years. If you are a former pupil of Cockenzie School or have worked from the building at any point and would like to attend the birthday party, please contact Karen Murray on 07880 032350 or simply call in on Friday 5 June between 10 am and 2 pm. If you are looking for office space to rent in a character building, Cockenzie Business Centre could prove the ideal location. The centre is two miles to the east of Edinburgh and close to the A1, which connects the site with Berwick upon Tweed and Newcastle. Meeting rooms and mailboxes are available and the site has 24-hour access, plus free car parking facilities. For more information contact Gavin Luna on 0141 2212123.